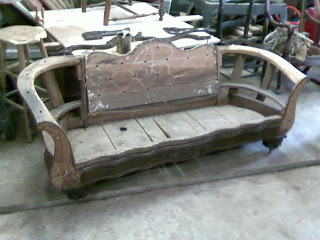 The third piece I am currently working on is a sofa dating to somewhere between 1845 and 1860. The style is called transitional meaning that it contains design elements from two separate furniture styles and was probably made during the years when one style was transitioning into the next. What is known largely as the Victorian period of furniture making saw a huge change in the way that furniture was manufactured. the Victorian era coincided with the Industrial Revolution. As a result, many processes that were once done by hand were being accomplished with the aid of specialized machines in factories. With the use of machines, several things became possible. First, ornamental pieces could be produced quickly and reproduced exactly. The use of templates and duplication equipment allowed furniture makers to offer the same piece on a larger scale. Second, with the aid of these machines and early milling machines furniture could be produced faster than in previous generations. 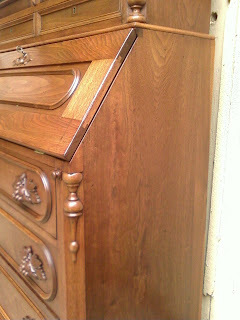 With these innovations came the ability for furniture designers to create furniture that was ornate and complex. What arose was several revival movements that happened in quick succession. 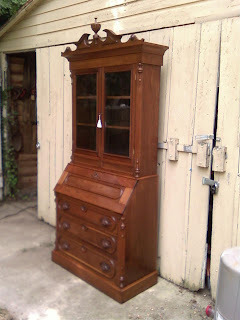 As makers moved from one style to another, they often mixed and matched using design elements from previous movements. Because of this, it is often hard to place a particular piece in one style. 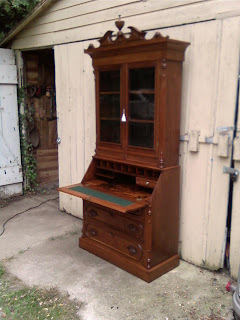 One can simply call it Victorian, and be done with it, or they can describe the different elements within the piece and identify the styles employed. In the case of this sofa, It contains many design elements of the later American Empire period. Most notably are the crotch veneer used on the apron and the overall design of the piece. the Rococo Revival design elements are seen in the serpentine shape of the apron and crest rail and the floral carvings on the crest rail. 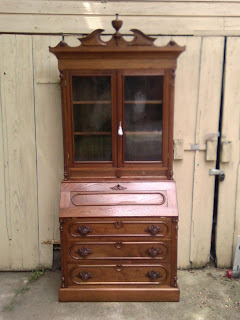 During the Empire movement, Mahogany was the wood of choice, and during the Rococo Revival movement and later the wood of favor was Walnut. Because of the mixing of all of these elements and the construction methods used for the framework I would date this piece to around 1855. If you look closely at the carvings on the piece you can see they are exact duplicates of the carvings on the piece I am working on. this indicates the use of machines to create the carvings. 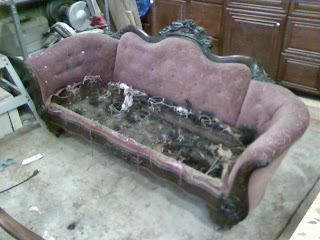 The sofa as it came to me was in need of new upholstery as well as refinishing. 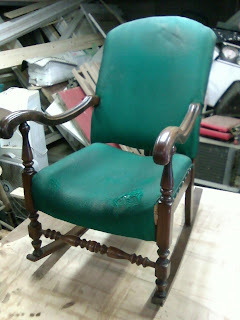 Below I have included some photos of the removal of the upholstery and finish as well as some repairs to the piece. The framework used wooden slats as a bottom instead of webbing. the springs were attached directly to the slats. 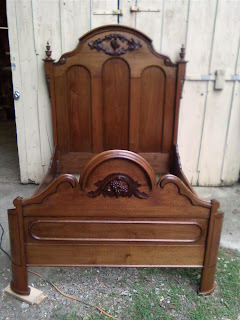 A photo of the frame with all of the upholstery removed and the carving element removed. Repairing a break in the right arm carving. 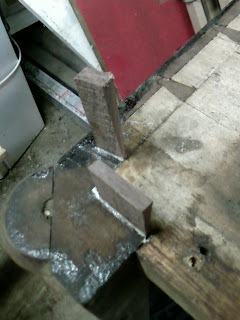 Repairing a break in the crest rail. 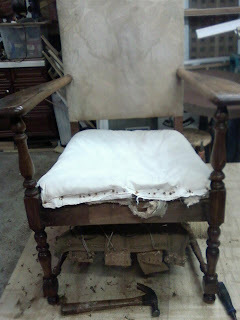 The arm chair I am currently working on along side the rocker and the sofa is similar to the rocker in construction and probably dates to the same period. There was no indication as to the manufacturer, but I can say that it was made in a factory. 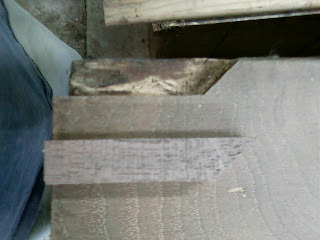 The primary wood used is mahogany and the secondary is maple. The Finish on the chair was not the original. 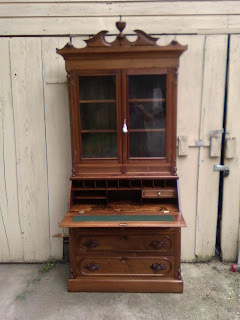 It was a polyurethane that had been applied several years ago and had yellowed and cracked. 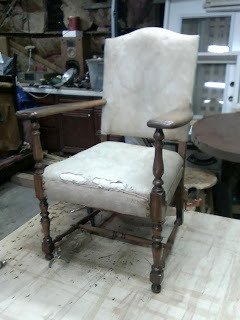 Below are photos of the arm chair before and after the upholstery and finish were removed and also a photo of the repairs being made. I am currently working on three pieces for a customer. They are an arm chair, a rocking chair, and a sofa. I decided to post each one separately to detail their histories and the work done to them. All three pieces are being reupholstered so I will be writing the final posts for these pieces after they are returned from the upholsterer. 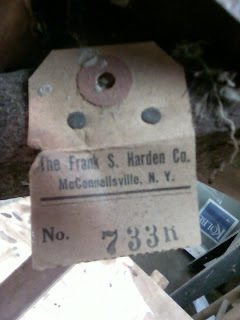 The first piece is a rocking chair manufactured by the Frank S. Harden Company of McConnellsville, New York. 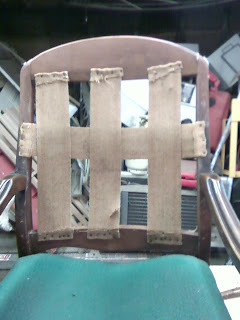 The design of this rocker is pretty common, but I thought that the story of the company was interesting. 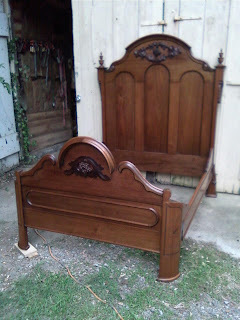 The Harden Furniture Company has operated as a family owned business since 1884 and is still in operation today. For more information on the company here are two links. the first is a brief history of the company and the second is a link to the company website. 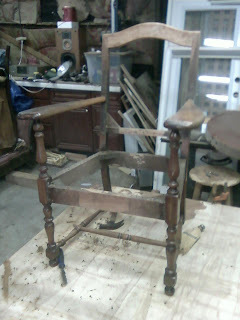 The finish on the rocking chair is in good condition, so it will not be removed. 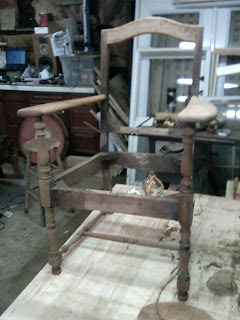 In the following pictures you can see the rocker during the process of the upholstery removal. 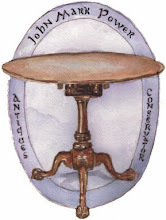 There is also a photo of the label for the chair which I found connected to the seat frame. I emailed the Harden Furniture Company a photo of the chair and they replied that the chair was made sometime between 1925 and 1940. I read that the company changed hands from father to sun around 1930 so I would put the date circa 1930. 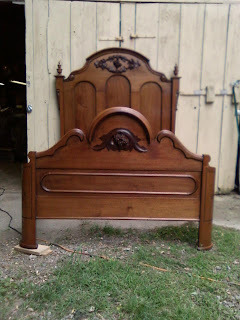 Here are a few shots of the Desk and the bed I have been working on. By looking at earlier posts you can see how different the pieces look with the new finish. 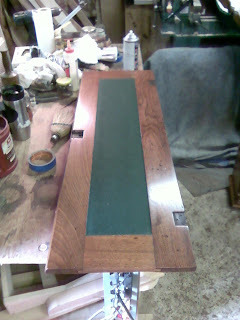 On the Secretary desk that I have been working on, the felt had been damaged badly over time and needed to be replaced. 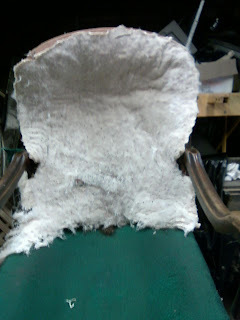 The first step was to remove the old felt and clean the surface area to prepare it for the new felt. I included photos of the cleaning process on an earlier post. Below are some photos of the process of installing the new felt on the writing surface. 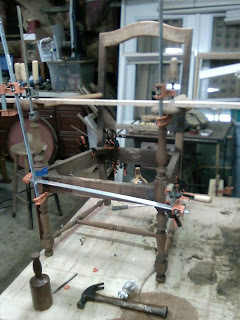 Typically, this is done with the aid of an assistant, but without extra help I used clamps to be my extra set of hands. 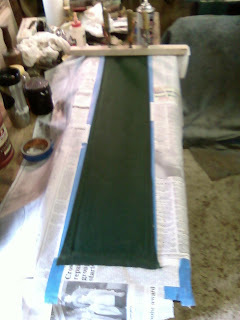 The photo below shows the writing surface cleaned and ready for the new felt to be attached. 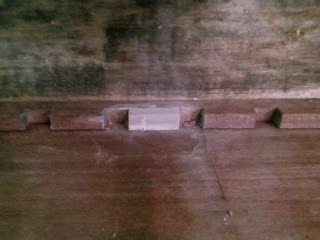 This photo shows the writing surface with the finished areas masked off to prevent glue from getting on it. This photo shows the felt being attached to the writing surface. 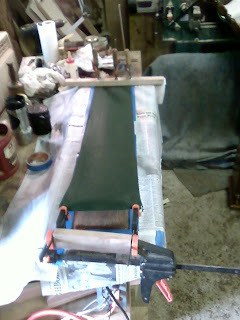 The felt is clamped down at the far end and stretched with clamps at the nearer end to allow me to work the felt into place without creasing it. 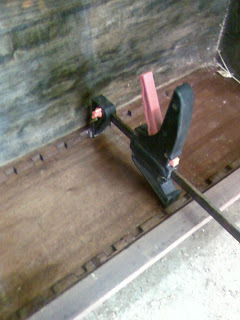 Here you can see the felt fully attachged to the writing surface and the clamps removed. 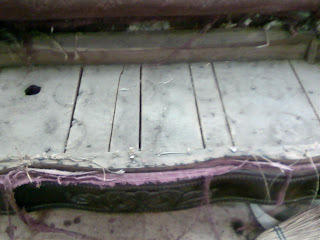 This final photo shows the felt after the excess was trimmed and the masking was removed. 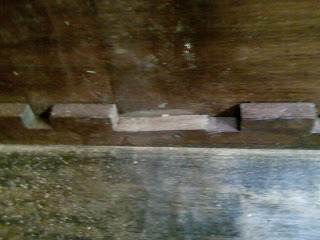 This is a photo of the shelf support system in the book case. In the photo there is a missing support. A new support was fashioned out of walnut. 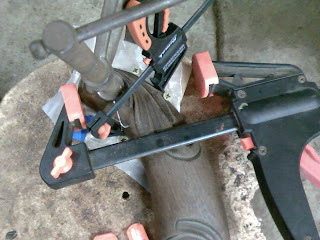 Gluing the new support in place. The new support glued in place and ready for staining. A section was missing from the corner of the book case section. A patch was fashioned to replace the missing section and the space was carved to fit the patch. Gluing the patch in place. 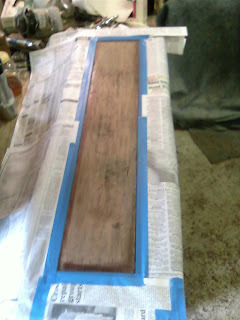 The completed patch sanded and ready for staining. 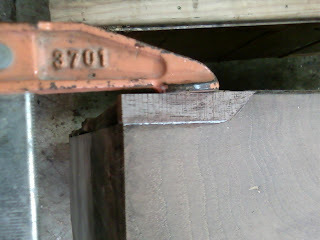 This photo shows wedges put in place to tighten the joinery on the book case. After the glue dried the wedges were carved flush with the surface of the case. 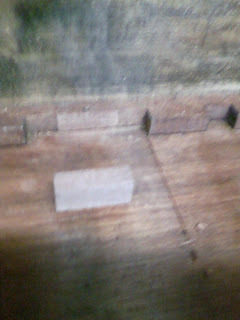 This photo shows a sanded shelf (left) next to a shelf that has not been sanded. 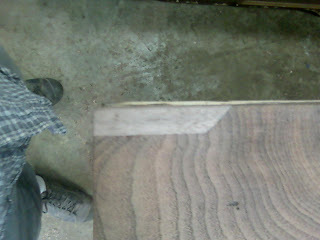 If you look closely on the unsanded shelf you can see lines going diagonally across the grain. 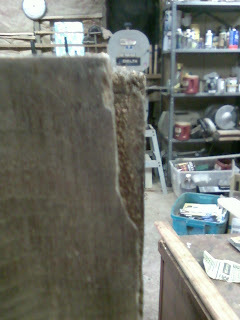 this is where someone sanded across the grain with a heavy abrasive. 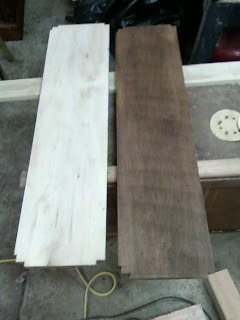 To correct this I needed to sand the scratches out also removing the stain from the shelves. 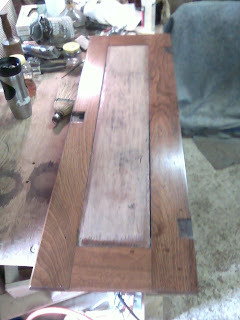 The stain will be replaced before finishing. 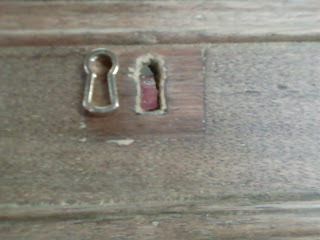 This photo is of an escutcheon next to a keyhole. 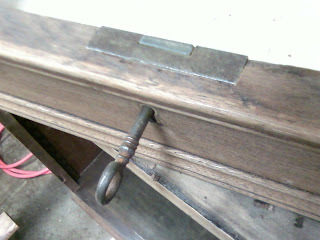 On this drawer the lock was missing as was the original escutcheon. 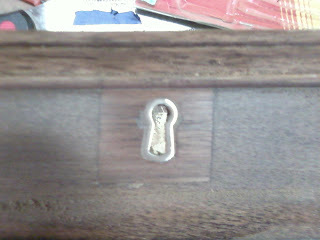 The drawer was damaged at some point and patched and a new keyhole was carved. 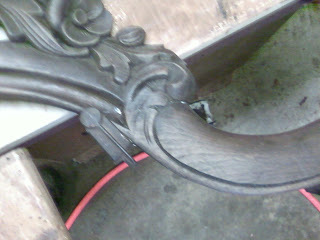 This is a photo of the new escutcheon in place. The old patch is clearly seen in this photo. This photo shows the new lock and escutcheon installed with the key fit to the lock.